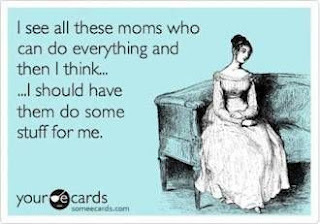 Downdogs and Deadlines: How Did Mom Do It? I'm not sure how old I was when my mom went back to work full time. Certainly I was still in elementary school. Maybe once my sister got into first grade? Which means I would have been in fifth grade. I'm not totally sure. My sister and I were very involved in sports, dance, Girl Scouts and anything else we could convince my parents we just HAD to do. My mom was the primary chauffeur. I was thinking about all this recently as I struggle with my new role as a full-time working mom yet while still trying to be the chauffeur mom, be-there-for-my-kids mom that my mom always was. How the hell did she do it all? I have given this a lot of thought. I can recall very few times we had fast food for dinner. How did my mom work all day, get us to our activities and still make dinner? And when I say dinner I don't mean the Tyson frozen chicken crap my kids have gotten used to. It was a real dinner. With real vegetables. Eaten at the table. I don't ever remember either me or my sister standing in the kitchen crying and screaming "I HATE YOUR JOB YOU'RE NEVER HOME ANYMORE" to my mom. Yeah, that's been heard around here. Actually it's been heard around here a lot lately. But the thing is, I'm pretty lucky to have a flexible job for now. I can't keep the job too much longer because soon I will lose my ex-husbands insurance benefits and I have no retirement savings. So it's time to start thinking more long term to take care of myself in my job search. So really, my kids have it pretty good right now and have a lot of access to me all day. I can only hope, but can't guarantee, this will continue in a new job. But for now, I can get up and leave at a moments notice. And I have. My kids can call me anytime. And I answer. If I can't answer my fabulous staff know to answer for me when they see it's one of my kids calling me. If I can't drive the girls to dance myself I have an older son who helps out when he's not working himself. Or friends to call when I'm really in a bind. As for dinner, well, I definitely haven't been as successful as my mom there. Chick-fil-A and Lenny's Subs are on our rotating schedule. We pack Lunchables for dinner on our really late nights at the dance school. Meals eaten together at the table are a rare, yet special, event. I wonder if my mom felt like a failure as often as I do? I hope my kids forget my failures and remember me in the way I remember my own mom.